"The St. Francis Inn, a block from the 'Oldest House' on the corner of St. Francis and St. George Streets, is filled with all kinds of collectibles and has a delightful little tree-shaded courtyard." St Francis Inn is on the National Register of Historic Places. 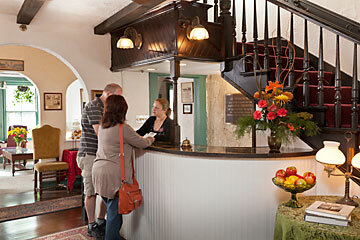 Dating from 1791, it is unquestionably St. Augustine's "oldest inn." The building itself embodies the rich history and culture of the nation's oldest city, and visitors are invited to delve into the stories that comprise its colorful past. 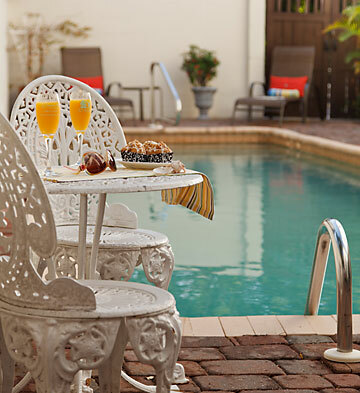 The Inn dates from the city's Second Spanish Colonial Period; its architecture reflects the early residents' concern for their own safety and protection. So great was the threat of invasion that, by order of the King of Spain, houses were to be constructed so that they might "serve as a defense of fortress against those who might attempt to occupy the town." Consequently, the building stands directly on the street, shielding the front entrance and peaceful courtyard enjoyed by visitors and residents alike. "What greater release from life's tensions than to rock oneself like a baby, perhaps sipping a drink, amid the restful green treetops, hearing the splashing fountain in the courtyard below?" Gaspar Garcia, the property's first owner, was a military man. A sergeant in the Third Battalion of the Infantry Regiment of Cuba, he was granted the lot in 1791 by the King of Spain, and shortly thereafter built a home. In 1802, the property was purchased by Juan Ruggiers, a sea captain, whose family held it until the early years of American rule in Florida. Subsequent owners and residents included other military figures. In 1838 it became the property of Colonel Thomas Henry Dummett. 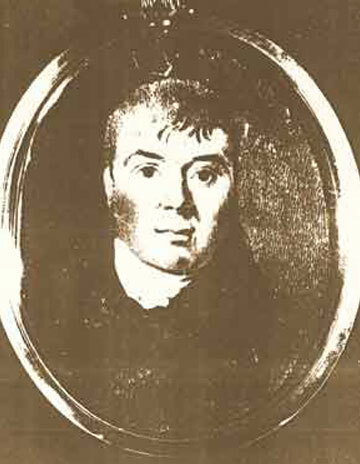 Dummett (1775-1839), who grew up on the Caribbean island of Barbados, retired from Britain's Royal Marines and began a sugar plantation. He and his wife Mary had 11 children, however only six lived to adulthood. In 1819, Dummett had moved his family to America after the English ban on slave trade caused many planters in the colonies to give up their way of life. There is a story that British authorities tried to detain Dummett and that he smuggled himself aboard a ship, hiding in an empty sugar barrel. In 1825, Dummett bought several hundred acres along the Tomoka River south of St. Augustine and built a sugar mill plantation. After a few years of struggling, and developing a rum distillery to process some of his crop, Dummett began to prosper. 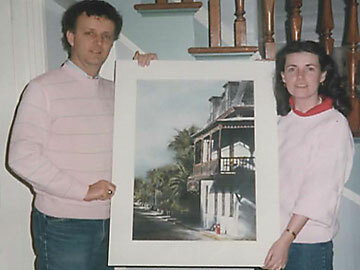 Like other well-to-do planters, Dummett kept a house in St. Augustine, purchasing what is now the St. Francis Inn in 1842. Carrying on the military tradition, Colonel Dummett's daughter Elizabeth married William Joseph Hardee when he was hospitalized while stricken with illness during the Seminole Wars (1835-42). Hardee was an 1838 graduate of West Point , lieutenant colonel in the Mexican-American War, leader of the Texas Rangers, and a Confederate General. 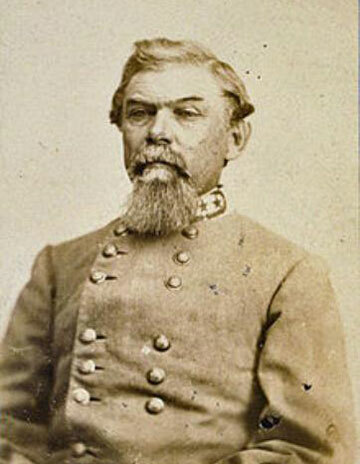 Another Dummett daughter married Brigadier General Melville A. Cochran, whose book of reminiscences described the Inn as "one of the best in St. Augustine" at the time of the Civil War. After Colonel Dummett's death, his daughter Anna Marie (1817-1899), who never married, converted the family home into a lodging establishment in 1845. Anna raised 10 nieces and nephews -- children of three of her sisters who had died before the 1860s. When Florida seceded from the Union in 1861, Anna embraced the Confederate cause, even though St. Augustine was quickly occupied by Northern troops and remained under Yankee control until peace came in 1865. After the war, Anna led a drive to collect money for a monument to the Confederate dead. The monument, an obelisk, still stands in St. Augustine's central plaza. Anna lived until 1899 and left memoirs of her childhood on the plantation. Sub-tropical forest has reclaimed her father's Florida sugar plantation, but jumbled piles of brick, two stone arches and two tall coquina chimneys can be seen at the ruins, just off Old Dixie Highway, about a mile and a half north of the bridge over the Tomoka River in Ormond, Florida. A prominent philanthropist named John L. Wilson purchased the Inn in 1888. 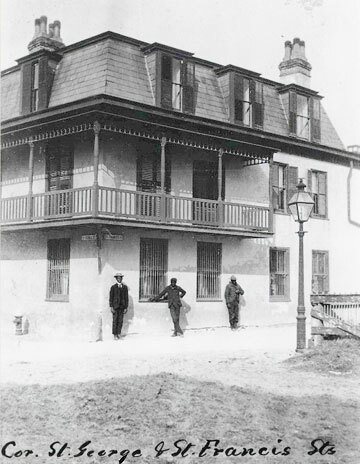 Along with extensive renovations to the Inn (such as adding the third floor and mansard roof), he was responsible for a number of new buildings in the neighboring area. 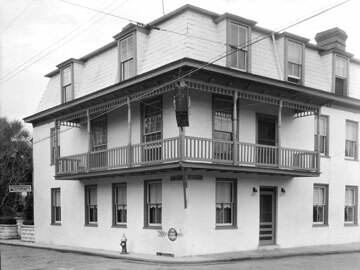 Wilson designed and built a house at 34 St. Francis Street which is currently occupied by our innkeepers and their family. 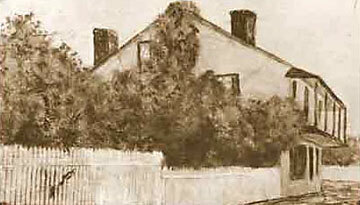 Later Mr. Wilson built the house at 280 St. George Street for his daughter Emily. This house, which we call the Wilson House, now includes four rooms and suites of St. Francis Inn. Wilson also donated the first public library, on Aviles Street, on the one condition that Emily Wilson be the librarian! In the 19th century, the Inn's owners and occupants included many literary figures and educators. Among them were Aaron Jones, publisher of the East Florida Advocate and the St Augustine News, and Dr. William Haynes Simmons, author of Notices of East Florida, still in print as a classic of Floridiana. Another notable literary resident and guest at the Inn was Pulitzer Prize and National Book Award winner Van Wycks Brooks, author of The Flowering of New England, The Wine of the Puritans, The Malady of the Ideal, John Adington Symonds, The World of H.G.Wells, and The Ordeal of Mark Twain. One of two female authors who resided at the Inn was Mrs. Verle Pope (Edith Everett Taylor), who wrote Half Holiday and The Biggety Chameleon and Colcorton, a runner-up for the Pulitzer Prize. She was a close friend of Marjorie Kinnan Rawlings, and her editor at Scribner's was the legendary Maxwell Perkins. The second was Mrs. Gladys Hasty Carroll, author of the widely read novel As the Earth Turns. It should be noted that the Inn was not always named "St. Francis." 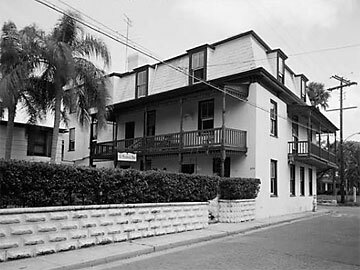 During the early 1900s, the building was identified as "The Teahan House," "The Hudson House," "The Valencia Annex," (named after the Valencia Hotel which was located on the side of our current parking lot), "The Amity Apartments," "The Salt Air Apartments," "The Palms," and "The Graham House" (see the original signboard in the countertop at our front desk). 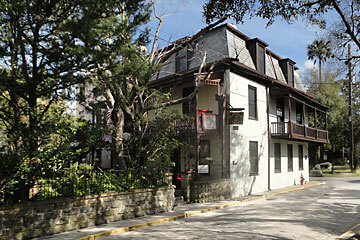 Historically, it is identified as the "Garcia-Dummett House," after some of its early owners. 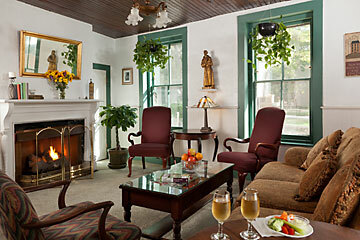 It was not until 1948 that the Inn was christened "The St. Francis Inn." 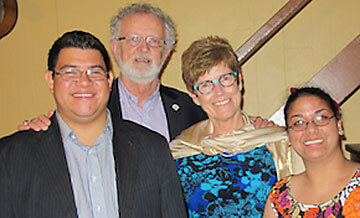 Most recently, the St. Francis Inn added two new unique accommodations in a historic home just a few blocks away. The "1894 House," named for its year of construction, features two apartment-style suites of rooms. The first floor is called "Sailor's Rest." The second story is "Ambrose's Retreat," named for one of the Victorian style home's early owners, Ambrose Colee, a member of the family which operated the first and longest-running horse carriage business in St. Augustine. 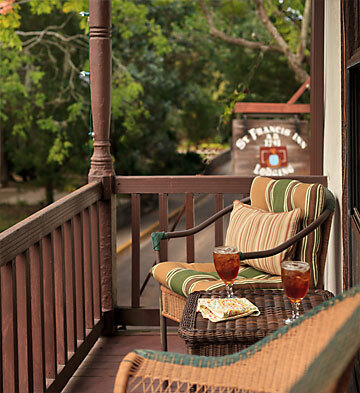 An old city like St. Augustine was not designed for the vehicle traffic of today, but the St. Francis Inn has off-street parking for guests, conveniently adjacent to the Inn. Our parking lot (once the site of the Valencia Hotel) is on the west side of St. George Street (which is a narrow brick paved street, one way running north to south). The parking lot is identified with a sign that reads "St. Francis Inn Guest Parking." The main Inn is across the street. See our layout on the Property Map. 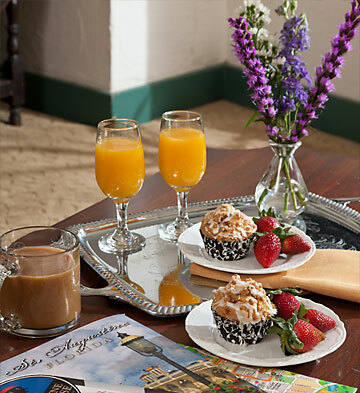 "We welcome you to enjoy our unique array of lodging properties: visit the past in our historic inn in the midst of the Old City, find your place at the beach in one of several homey lodgings we offer at St. Augustine Beach, or absorb the peacefulness of the Camachee Island marina!"